While fisheye panoramic cameras have been around for more than a decade, over the last few years momentum has accelerated with a number of new entrants. 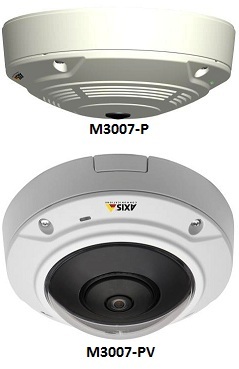 Now, Axis is launching its own panoramic camera - the M3007, sure to accelerate the market. In this note, we examine how Axis's integration approach differs from others, how it will impact critical 3rd party VMS support, what key limitations it has and how it stacks up against Immervision, Arecont and others. 2MP (1600x1200) dewarped images, cropped from a 5MP image sensor. Note: Do not be mislead by multiple Axis references to a 5MP sensor. Yes, it has a 5MP sensor but only 40% of that is streamed out. Color-only, no day/night models. The M3007 series uses a panoramic lens with an F2.8 rating, high even for panoramic cameras, which are commonly poor in low light conditions. On-camera dewarping but no client side immersive controls. This is a key feature of other panoramic cameras, such as ImmerVision and Sentry360, which record the full panorama in the VMS, and use client-side controls for digital PTZ in viewing and playback. Available in both standard (-P) and vandal-resistant models (-PV). The M3007's on-camera dewarping allows users to select from multiple views, such as the 360º panoramic overview, dual 180º panoramas, or quad view. These views are sent as a single stream with 2MP resolution (1600x1200). This means each of the four areas in the quad view would have a resolution of 800x600, or each 180º panorama would have a resolution of 1600x600. Axis is claiming a "coverage area" of about 7,000 square feet with the M3007, or a radius of about 50'. At this range, this is ~8 pixels per foot. Video at this resolution is suitable for detection but only in ideal lighting conditions, providing few details, as can be seen in our PPF comparison. This is not unique to Axis, but is a common problem among panoramic cameras, due to their extremely wide field of view. M3007 models are planned for release in Q4 2012. The M3007-P has an MSRP of $599 USD, while the -PV is priced at $649. At release, the M3007 will be integrated with Axis Camera Station and Axis Camera Companion. However, ACC will only provide the 360º overview, with no dewarped views available. Third party VMSes can call up different views with no need for dewarping on the VMS client side. This eliminates implementing complex client-side dewarping SDKs, instead calling up different views similar to PTZ presets. While no third party integrations are available yet, given the relatively simple integration approach and Axis's large market share, we expect this camera to have the broadest third party support of any fisheye in the next year. No immersive controls: Early fisheye / panoramic cameras allowed users to remotely pan, tilt and digitally zoom throughout the entire 360 area (see Q14 test results for example). Those controls that many enjoy, are not provided. View limitations: Since no client-side immersive controls are provided, users do not have fine control of camera views from the VMS. Users must use the camera's web interface to adjust views. The M3007 SDK is expected to provide VMSs switching of views once set. Recording limitations: Since the M3007 sends only a single 1600x1200 stream to the VMS, whatever is viewed in the stream is recorded by the VMS. Unlike other panoramic providers which are more fully integrated with client-side dewarping, such as Sentry360 and ImmerVision, users may not navigate recorded video using immersive digital PTZ controls. ImmerVision lens + Full HD fixed box camera: ~$1,250; ~$500 for lens, ~$750 for camera, such as Sony CH240 (provides client-side immersive controls). Despite Axis' lower price, Mobotix, Sentry360, and ImmerVision all offer client-side immersive controls, instead of on-camera dewarping. Additionally, others offer higher-resolution options than the M3007, with options up to 10MP from Sentry360. Finally, ImmerVision provides users with the widest range of camera options, allowing wide dynamic or low-light cameras to be used to better fit applications. However, given that Axis' entire camera is only slightly less than the cost of just the Immervision lens, this will likely push ImmerVision into more of high end niche use cases. The most direct comparison is likely Vivotek's 5MP fisheye (FE8172) which typically integrates with no client side dewarping. However, in a surprising turn of events, the Vivotek FE8172 street price is $200+ more than Axis's MSRP, making the Axis quite attractive. The other important comparison is Arecont's SurroundVideo line, a multi-imager panoramic offering. While Arecont offers 360 and 180 versions, the Axis models only potentially compare to the 360 versions. However, the Arecont 180s (with 4 imagers each covering a 45 degree area) are far more popular than their 360s and will almost certainly provide far more image details than the Axis's due to the Arecont's 180's much greater pixel density. As such, we do not see Axis's M3007 as a strong alternative or threat to Arecont's popular 180 models. Ultimately, the M3007 is likely to push mainstream acceptance of panoramic cameras. With Axis, the best-known brand in IP cameras, and an integrator favorite, entering the panoramic market at an attractive price point, this will draw more attention and respect. Further, their decision to implement on-camera dewarping via their SDK should make VMS integration easier, and help spur wider adoption, which has been a key challenge for panoramic camera manufacturers in the past. However, those preferring client side dewarping and controls will likely be disappointed.